Choose Back Up Your Computer (beneath the System and Security heading). Click the button Restore My Files. Add files and folders to be recovered. Search: Click the Search button to summon the Search for Files to Restore window, where you can hunt down the files you want to restore. 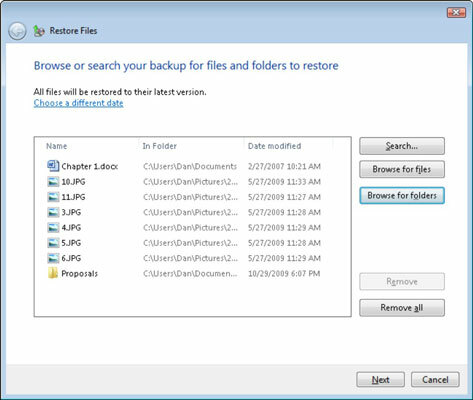 Browse for File: Click this button to choose individual files to restore. Browse for Folders: Click this button to restore an entire folder — and all files and folders in that folder. After choosing a button, you see another dialog box from which you choose the files. The dialog box lists files on the backup, not on your computer. Choose your user account from the list of folders on the left side of the window to locate your personal files and folders. Then browse the folders to find the files or folders you’re looking for. Keep adding the files you want to restore; repeat Step 5 and keep clicking the buttons to collect all the files and folders you want to restore. In the original location: The files and folders you selected are placed back on the hard drive in the same folder where Backup found them. In the following location: You get to select in which folder to place the restored files. This option is best for recovering an older version of a file where you don’t want to overwrite the current version. The only kink in the hose happens when you attempt to restore a backed-up file and the same file still exists on the hard drive. A warning message appears. Copy and Replace: The backup file replaces the existing file. This option is most likely the one you want, unless you want to keep both versions of the file. In that case, choose the option Copy and Keep Both Files. Don’t Copy: The file isn’t restored. Choosing this option basically undoes the restore operation for that lone file. 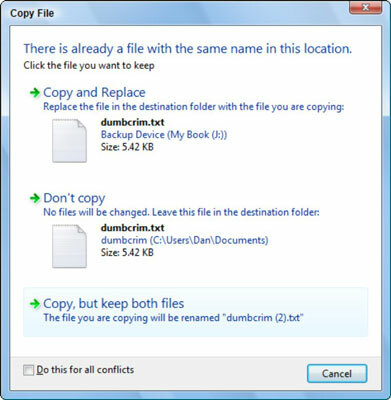 Copy, but Keep Both Files: The file is restored but given a new name. Both files exist in the same folder: the current one and the restored copy with a number in parentheses after its name. If you have any doubt, please choose the option Don’t Copy. You can always try to restore the file later, but you don’t want to lose something unexpectedly. You can also start the restore operation in the Backup and Restore Center window by clicking the Restore Files button. The files you restore aren’t removed from the backup set. If the need arises, you can restore them again. Recovering a deleted file from the Recycle Bin is easier than recovering a file from a backup.